Unlike other reviews or complaints about the online experience my grip with the online version is pretty stupid by comparison. 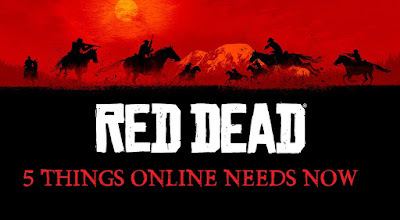 Yes, I don't like the gold bar system or the endless hunting to rack up money but these are thing that take a backseat to my main problem with the game. Well, actually, there are five complaints or lets call them suggestions to make the game as good as the previous one. 1. Land Grab - King of the Castle is okay, but sometimes you just want to run into a place in free roam and lock that shite down. No loading out or leaving your current map, just hit up the local marker and fend off others for as long as possible. 2. Most Wanted/Bounties - If I want to run around shooting up the town while tying up the other players there needs to be consequences. I should become most wanted and a bounty should be placed on my head. There should also be a nice xp/money reward for the player who takes me out. They put in the work to deliver Sweet Justice so they should be rewarded. 3. Sweet Justice (Narrator) - This provides nothing but enjoyment. I like hearing Bert Pence tell me I have the highest score or someone wants me in their posse. 4. Ammo/Weapons - If I kill a NPC or Player I should be able to pick there body clean of ammo and weapons. Just like previously I should be able to use those weapons until my session ends. 5. The Roll and Jumping - My character should be able to jump. As it sits now he looks like a retarded dog with balance issues trying to get up on a curb. Also I'd like to be able to roll not just dive sideways. There it is, my five things that, I believe, would really help out the game. Sure fixing a lot of other things would be nice too, but these are just stupid little things that I'm sure players would have liked right from the gate. I guess we'll see what gets added here in the next two updates and then will go from there.